Chicago Marist Men up at dawn, training to WIN the STATE Championships in 2018! 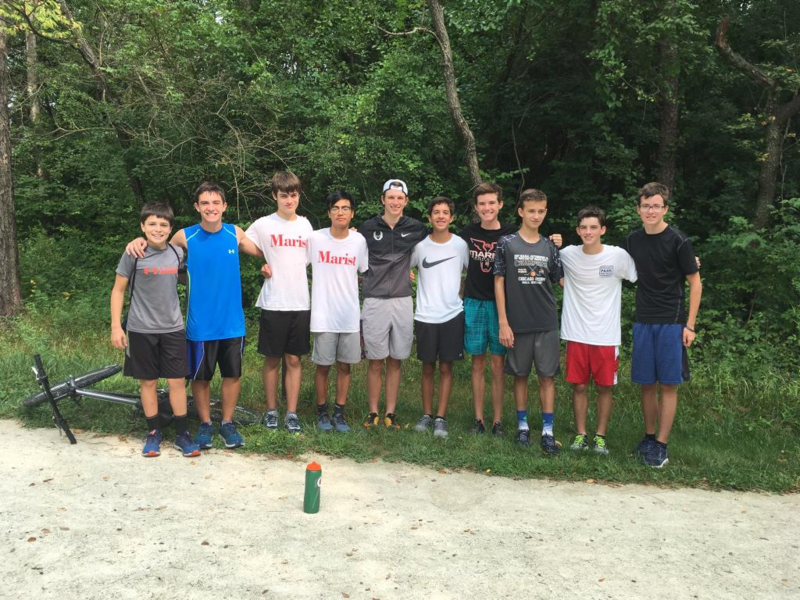 On Tuesday, June, 19, 2018, while most of the State was sleeping, members of the Marist Mens Cross Country Team arrived on campus at 7:30 am to train to contend for the 2018 IHSA State Championships! 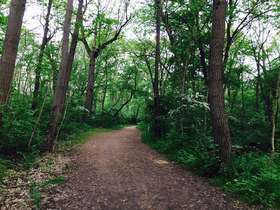 Marist Head Coach Jon Gordon drove the TEAM bus to Forty Acre Woods Running Trails in the Cook County Forest Preserve in Palos Park, Illinois. 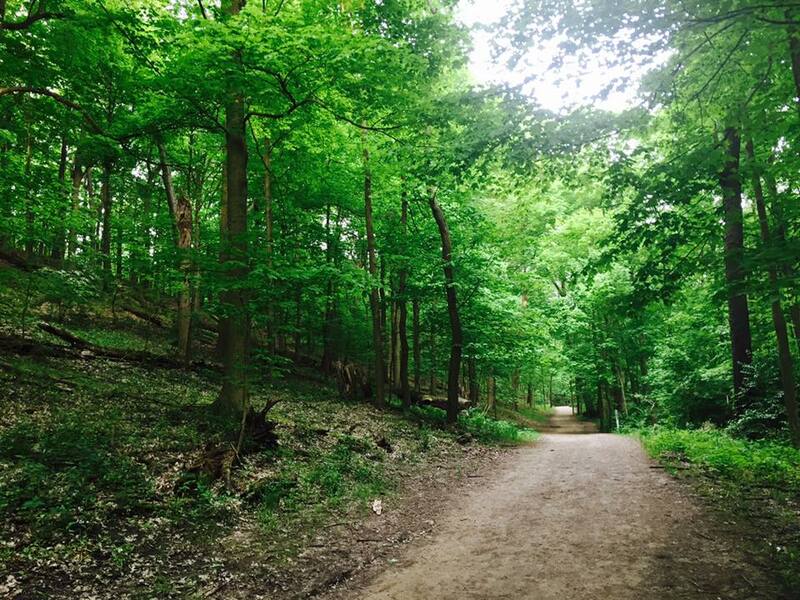 There are multiple advantages to running on Trails. Trail surfaces are softer than pavement or concrete. As a result, less force is being applied to your body from the running surface, specifically your legs, resulting in lower impact and lower stress. This allows athletes to run more miles. The varying terrain combined with numerous obstacles forces greater proprioception and muscle engagement, specifically stabilizing muscles, and strengthens muscles in your foot and ankle. Often times the monotonous, one direction ovement of road running leaves these stabilizing muscles and ligaments underworked. Hills on a trail run vary in grade (steepness) and length, thus constantly challenging your legs and lungs with variety. Marist recently began summer trail runs, after a successful running camp June 11 - 15. 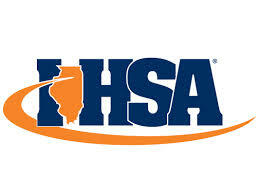 IHSA announces Marist will host the IHSA Sectional Championships!! The IHSA announced that Chicago Marist will host the Class 3A IHSA Sectional Cross Country Championships on October 27, 2018. 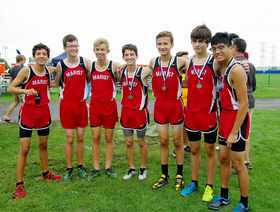 Marist Varsity Boys Cross Country Team Tryouts start Wednesday, August 8, 2018, 3 PM, be prompt!!! Barbecue on August 17! 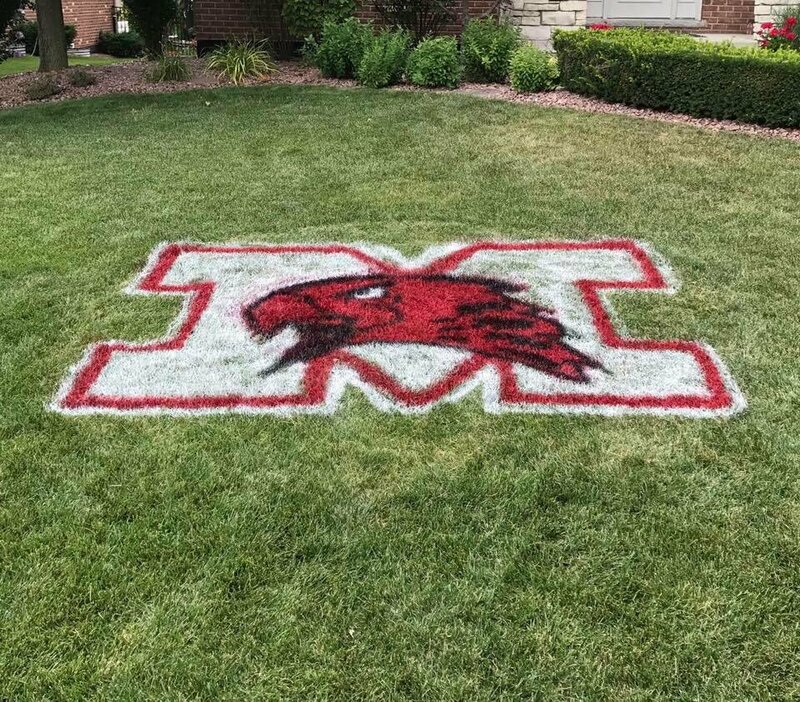 Welcome to the home of the RedHawks! 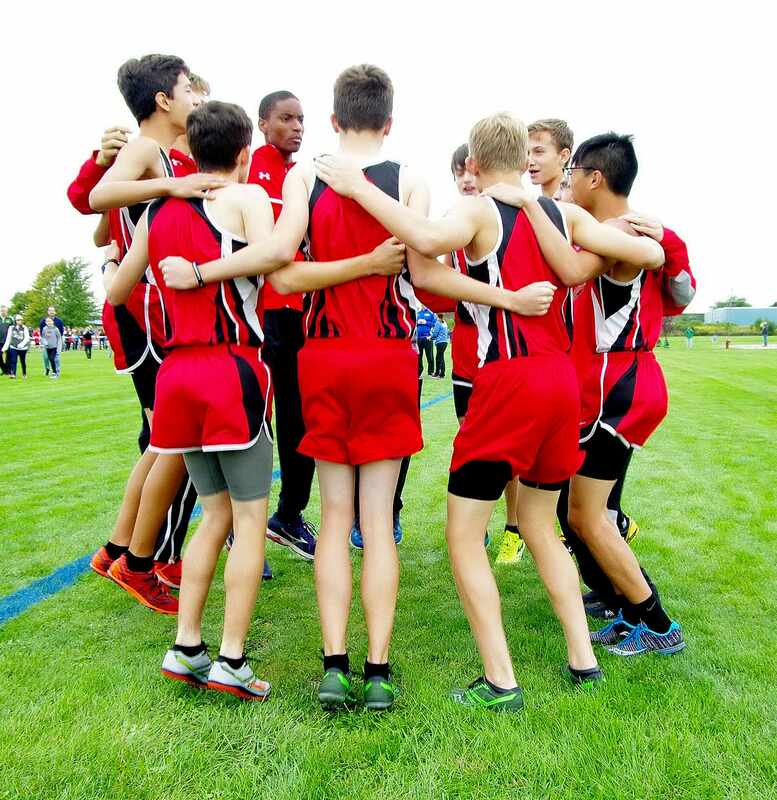 Chicago Marist Boys Cross Country TEAM is a proud member of the East Suburban Catholic Conference and Illinois High School Association. Our dedicated coaches and athletes train and compete on our 55 acre campus complete with premiere facilities. On Wednesday, August 8, 2018, the first day of official Cross Country practices will commence at 3:00 pm, in front of the Marist Track and Field Stadium. Athletes must turn in a current Physical before you can attend a Marist Cross Country Practice. Athletes and Parents must also pre-register for the Cross Country TEAM online at www.athletics2000.com/marist and select the registration tab. Click on “Create An Account” and enter your own email and create your own password. (Please be sure to remember this password as you will use this for the years to come). Click on “Begin Registration” • “Select Activity - Cross Country”. All athletes should bring running shoes, and a Water bottle to practice. If you have anything to place in storage during practice, please bring a combination lock. There will be no one available to hold any personal items during practice. Thanks. Try-outs will determine our initial Varsity, Junior Varsity, and Sophomore-Freshman rosters for the first meet. Only the top 7 athletes on the Team, run Varsity, and only the Top 7 Sophomores and Freshman run on the Sophomore squad. Everyone else runs on our outstanding Junior Varsity TEAM. No one will be cut from the TEAM. Athletes have covered many hundreds of miles this summer preparing to capture the Regional, Sectional, and State Championships. We certainly hope that you too have been conscientious about your summer training. We want you to report to the first practice READY TO RUN. Wednesday, August 8, 2018 means 87 days until the STATE meet! A TEAM / PARENTS meeting will take place at 5:00 pm in the main gymansium on Friday, August 17, 2018. Red and White night will be following the TEAM / PARENTS meeting. Following the meeting, from 6:15 pm - 7:35 pm there will be a PARTY in the east parking lot with music, games, and more. At 6:30 pm, a free barbecue will be served! 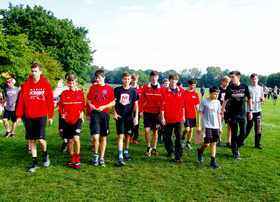 If you have any questions about Marist Cross Country, please contact Marist Head Boys Coach Jon Gordon at Gordon.Jon@Marist.net. Thanks. The Marist Cross Country TEAM will commence practice at 3 pm on Friday, August 17, 2018. Athletes will meet the coaching staff by the bleachers of the Track and Field Stadium. A TEAM / PARENTS meeting will take place at 5:00 pm in the main gymansium with Marist Athletic Director Eric Simpson. 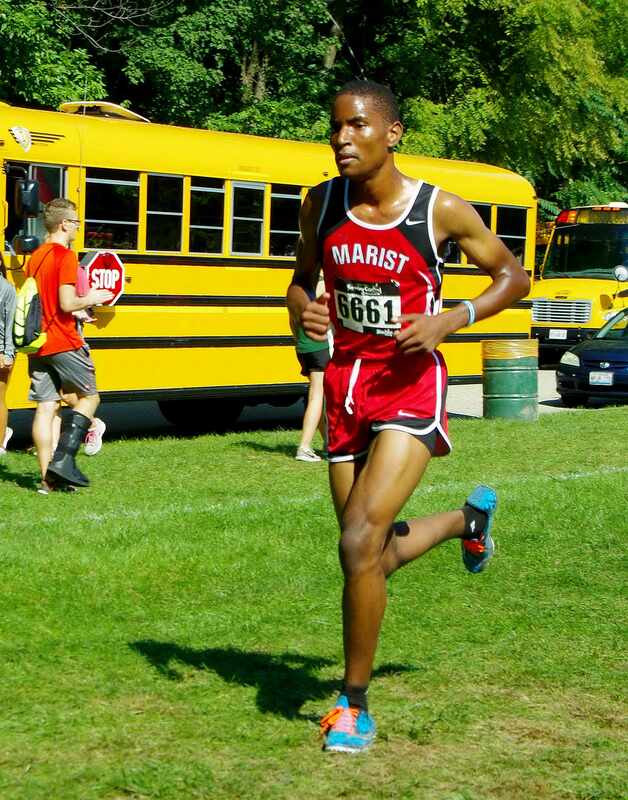 At 5:30 pm, the Boys Cross Country Team and Parents will meet in room 114 for a meeting with Marist Head Coach Jon Gordon, and Assistant Coaches Mac Melto, and Phillip Jones. A Parents guide to Cross Country and Team information packet will be distributed. Team Captains will be introduced. Topics for the meeting include: How a Cross Country meet is scored, Cross Country terms, 2018 Season schedule, Tailgate Partys, Pasta Partys, Racing photos, Proper running shoes, IHSA State Championships, Running in College, and the November Cross Country Banquet. Red and White night will be following the TEAM / PARENTS meeting. Following the meeting, from 6:15 pm - 7:35 pm there will be a PARTY in the east parking lot with music, games, and more. At 6:30 pm, a free barbecue will be served!If you have any questions about Marist Cross Country, please contact Marist Head Boys Coach Jon Gordon at Gordon.Jon@Marist.net. Thanks. 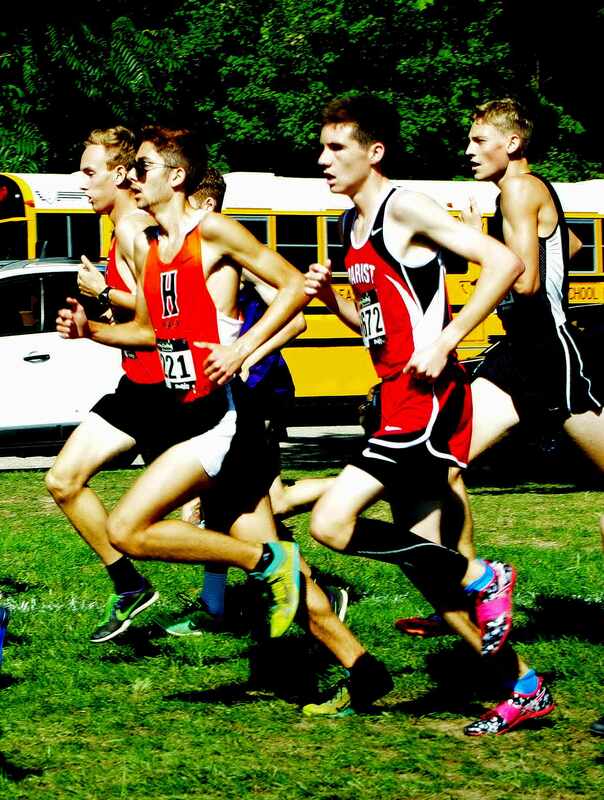 The Yorkville Cross Country Invitational in Kendall County in Yorkville, Illinois is the FIRST Cross Country meet of the season to take place for the entrie state of Illinois. 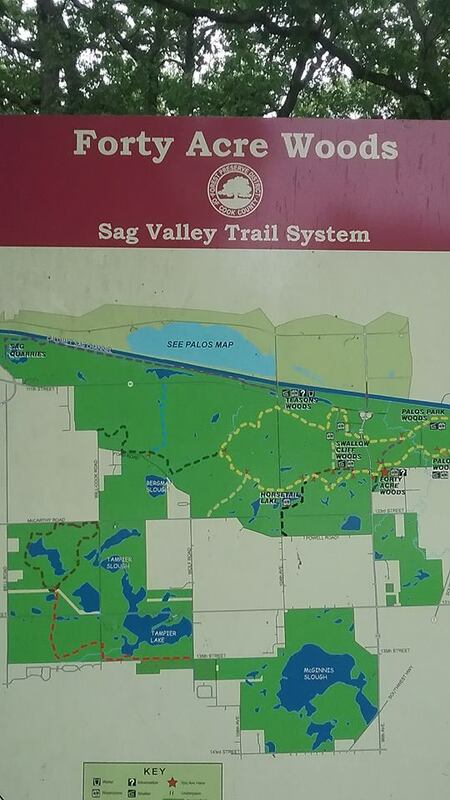 The race course is located at Hoover Forest Preserve (11285 W Fox Rd, Yorkville, IL 60560). The TEAM will travel by yellow school bus at 2:30 pm. The first race of the day will commence at 5:00 pm. All races are 3.0 miles. No spikes are used on the course because of patches of concreate and gravel throughout the course. Course Maps available under the link "Secret Training Plans". 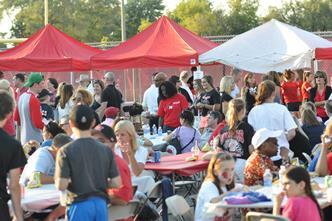 The Marist Coaching Staff and Parents will be hosting a Tailgate party after the meet. It will be a special experience for all of the athletes, parents, coaching staff, and guests. We need your help to make this event a success in 2018. 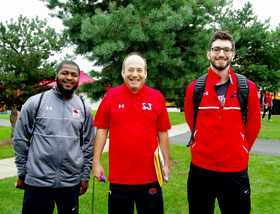 If you could bring any kind of finger food, drinks, paper ware, plastic ware, card tables, let Coach Gordon know via email at Gordon.Jon@marist.net and he will post a list of items being brought to the Tailgate Party on our Team website. Marist Sophomore Boys improve from 12th place to 4th place in one year at the Reavis Rams Invitational! Four Athletes earn Medals! 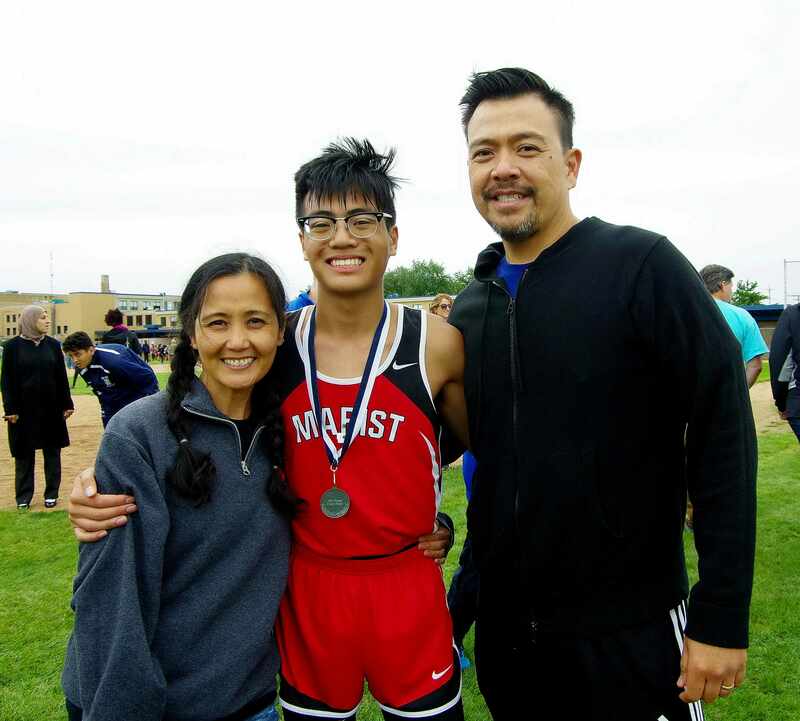 On Saturday, September 8, 2018, the Chicago Marist Sophomore Boys traveled to Burbank, Illinois for the 54th Annual Reavis Rams Invitational. USA Track and Field legend Skip Stolley, who won the first Reavis Rams Invitational in 1964, served as the meet announcer. Upon arrival, the Chicago Marist Redhawks were greeted by Marist Alumni, parents, and spectators. A special thanks to everyone for making the trip to Burbank, Illinois to support the Cross Country TEAM. Athletes walked the course prior to meet. In 2017, a very large hill was added to the race course, called "Harry's Hill", in honor of former Burbank Mayor Harry Klein. Harry Klein served as Mayor of Burbank for 26 years, from 1991 to 2017. In 2017, the Marist Sophomore Boys finished in 12th place with a score of 299 points, and had only one runner in the Top 50. 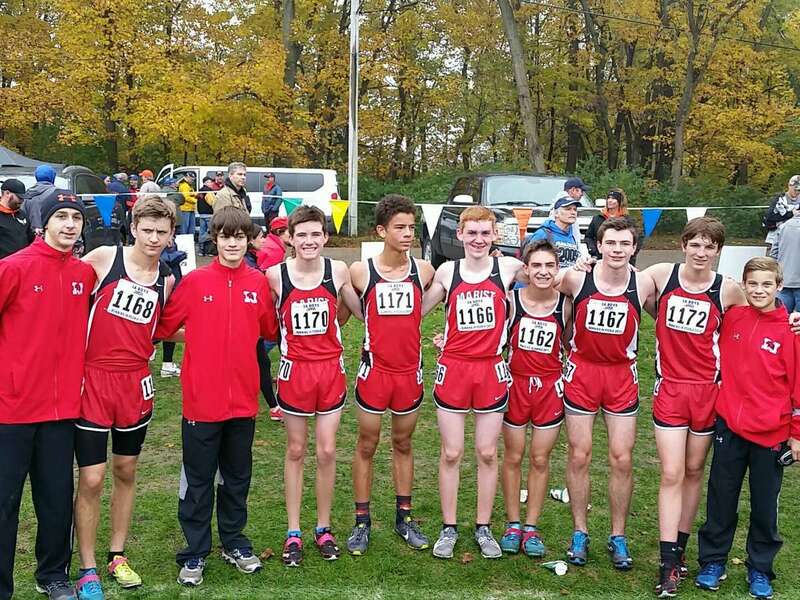 In 2018, the Marist Sophomore Boys finished in 4th place with a score of 129 points, and had FIVE athletes in the Top 50. Sandburg won the Sophomore division. Brother Rice finished in second place. Eisenhower finished in third place. The Marist Sophomore Boys finished in fourth place with 129 points, and posted victories over: 5. Reavis (143), 6. Leo (180), 7. Oak Lawn (187), 8. Stagg (204), 9. Thornton Fractional South (231), 10. Richards (232), 11. Argo (242), 12. Homewood-Flossmoor (340), 13. Oak Forest (378), 14. St. Laurence (433), 15. Mt. Camel (436), 16. Tinley Park (441), 18. Kennedy, 19. Marian Catholic, 20, Rich Central, 21. Solorio Academy, 22. St. Rita, and 23. Thornton Township. The Marist Sophomore Boys have a season record of 19-3. MEDALS were awarded for Athletes that placed in the Top 30, and Ribbons for Athletes that placed in the Top 50. 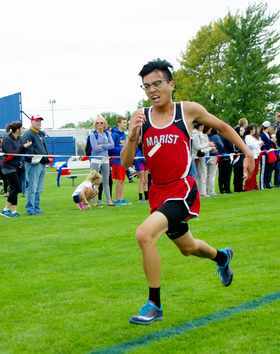 Marist Sophomore Jonathan Rivera earns a MEDAL by finishing in 14th place overall at the Reavis Rams Invitational! 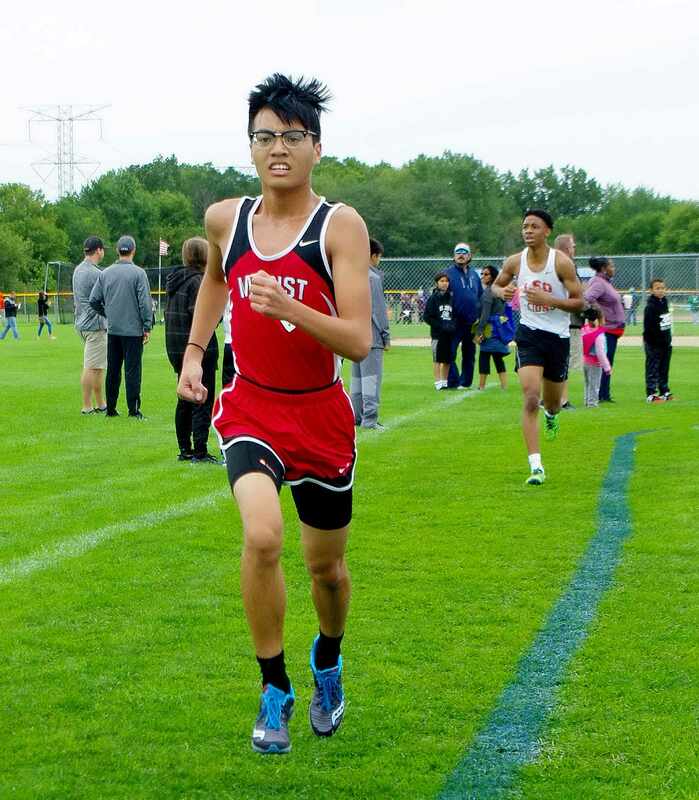 Jonathan Rivera led the Sophomore Boys at the Reavis Rams Invitational by finishing in 14th place overall with an outstanding time of 18:29.50. Jonathan Rivera dropped 40 seconds from the 2017 Reavis Rams Invitational (19:09.60) on the SAME race course. 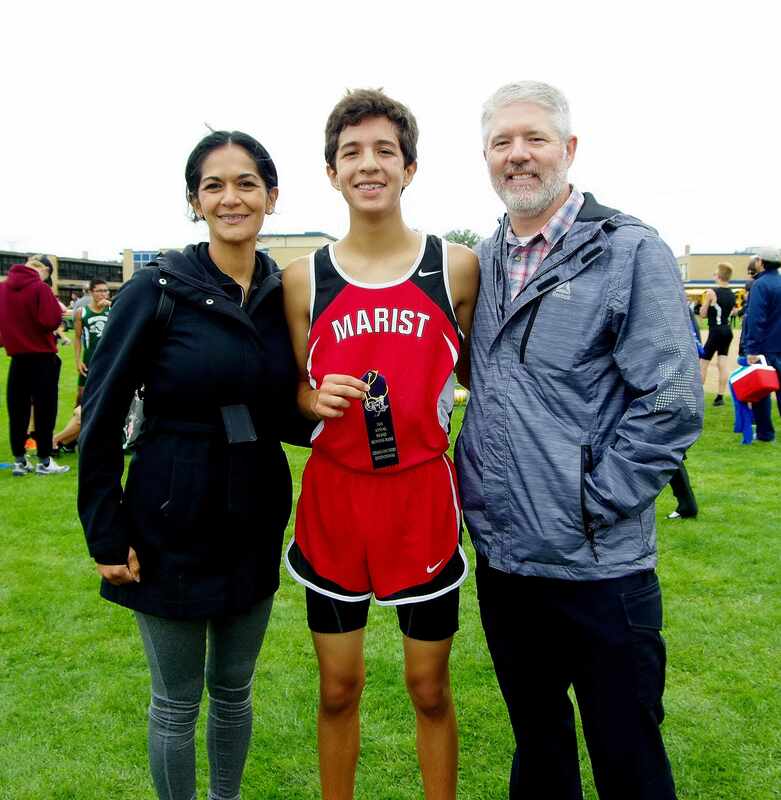 Marist Sophomore Jonathan Rivera ran the first mile in 6:09, and then ran the second mile in 6:15, and then ran the final mile in a NEGATIVE split of 6:05.50 for an official time of 18:29.50. Jonathan Rivera was awarded a MEDAL for finishing in 14th place overall. 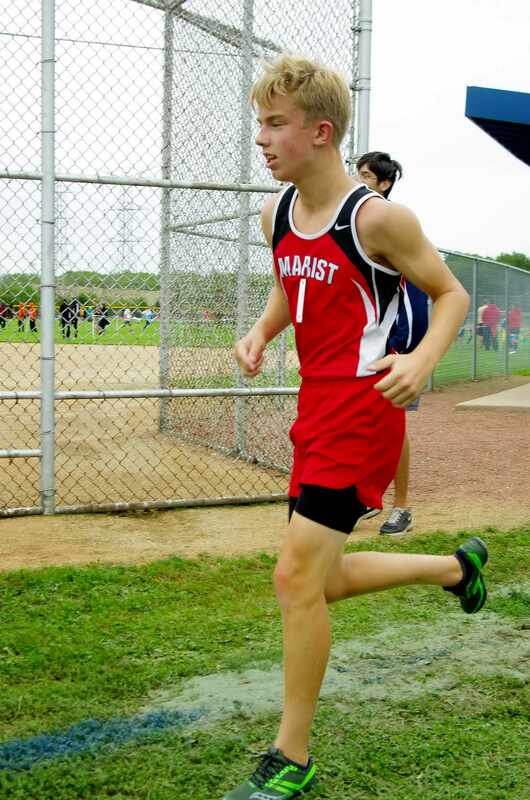 Marist Freshman Brendan Geary finishes in 21st place to earn a MEDAL at the Reavis Rams Invitational! 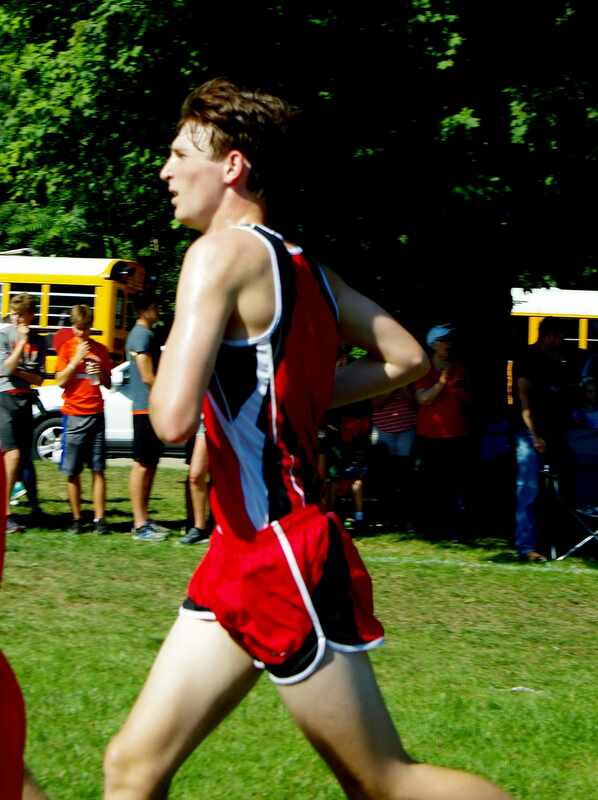 Brendan Geary finished second for the RedHawks and in 21st place overall at the Reavis Rams Invitational with a personal best time of 19:12.10. 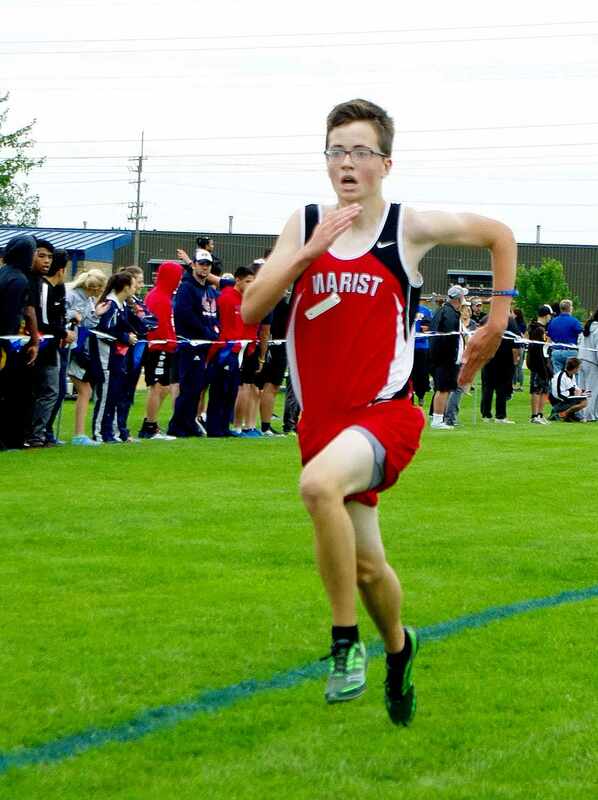 Marist Freshman Brendan Geary ran the first mile in 6:21, and then ran the second mile in 6:40, and then ran the final mile in a NEGATIVE split of 6:11.10 for an outstanding time of 19:12.10. Brendan Geary was awarded a MEDAL for finishing in 21st place overall. 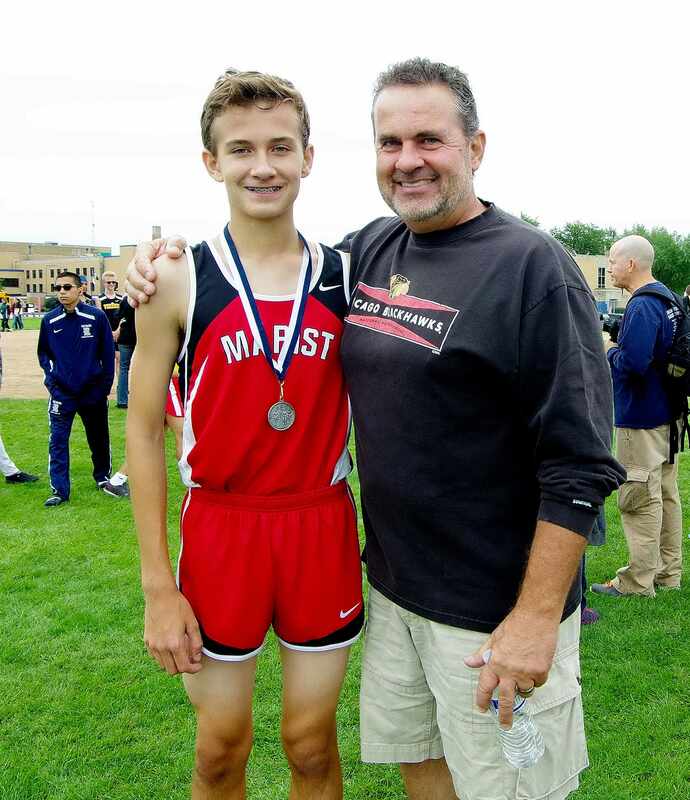 Marist Sophomore Tommy Kavanaugh earns a MEDAL by finishing in 25th place at the Reavis Rams Invitational! Tommy Kavanaugh finished third for the RedHawks in the Sophomore Boys race and in 25th place overall with an outstanding time of 19:35.40. Tommy Kavanaugh dropped one minute and 3 seconds (20:38.70) from the 2017 Reavis Rams Invitational on the SAME course. 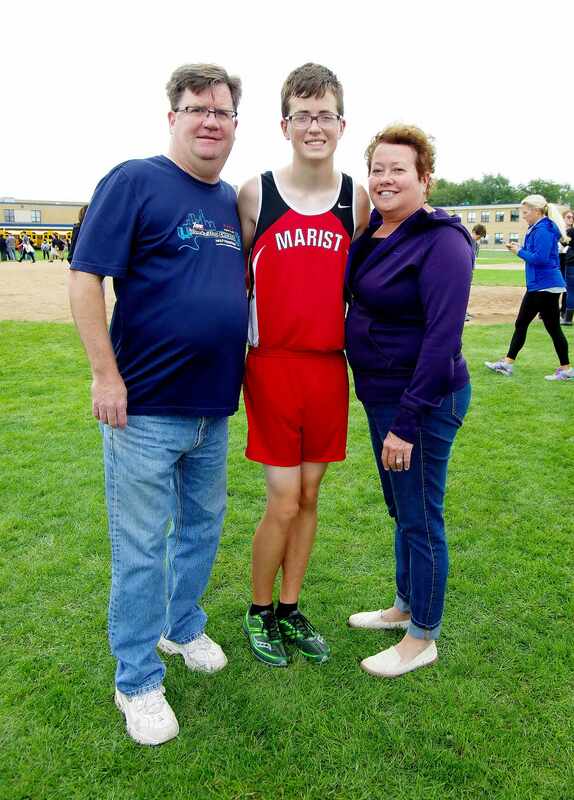 Marist Sophomore Tommy Kavanaugh ran the first mile in 6:11, and then ran the second mile in 6:45, and then ran the final mile in a NEGATIVE split for an official time of 6:39.40. Tommy Kavanaugh was awarded a MEDAL for placing 25th overall. 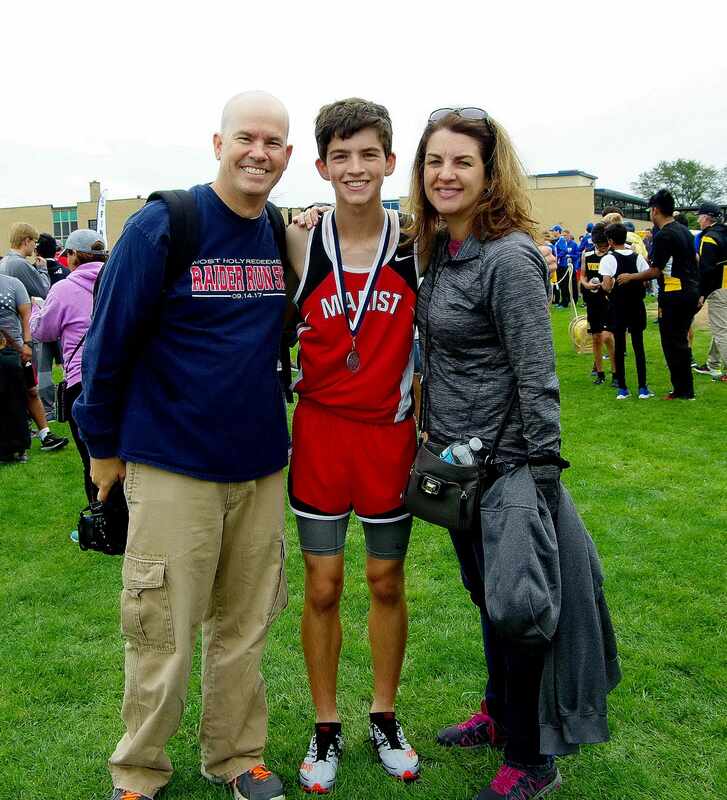 Marist Freshman Luke Malzone earns a MEDAL by finishing in 30th place at the Reavis Rams Invitational! Luke Malzone finished fourth for the RedHawks and in 30th place overall with an outstanding time of 19:48.40. 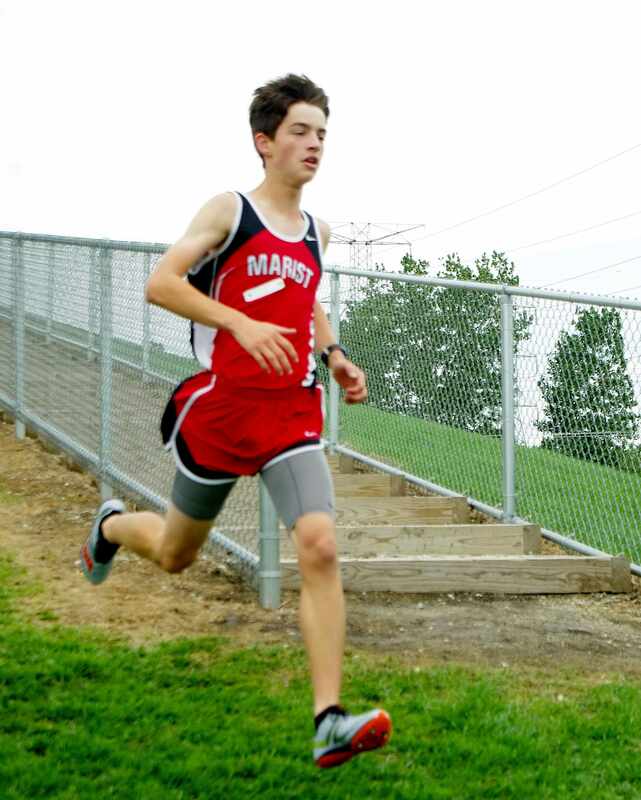 Marist Freshman Luke Malzone ran the first mile in 6:19, and then ran the second mile in 6:51, and then ran a NEGATIVE split of 6:38.40 on the final mile for an official time of 19:48.40. Luke Malzone was awarded a MEDAL for finishing in 30th place overall. 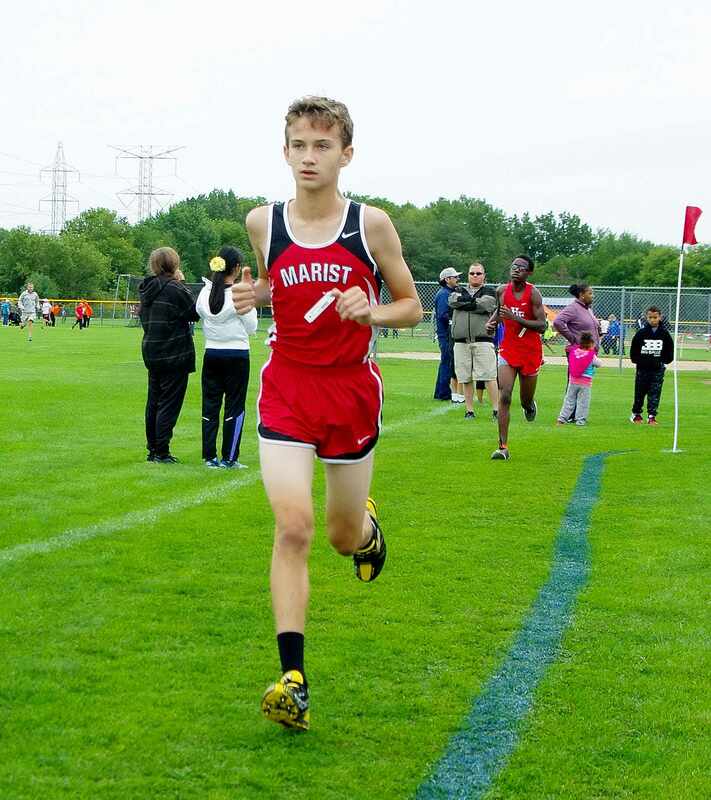 Marist Freshman Andrew Kerlin finishes in 42nd place to earn a RIBBON at the Reavis Rams Invitational! Andrew Kerlin finished fifth for the RedHawks to complete the scoring and in 42nd place overall with a personal best time of 20:22.00. Andrew Kerlin dropped 9.10 seconds off his career best time. 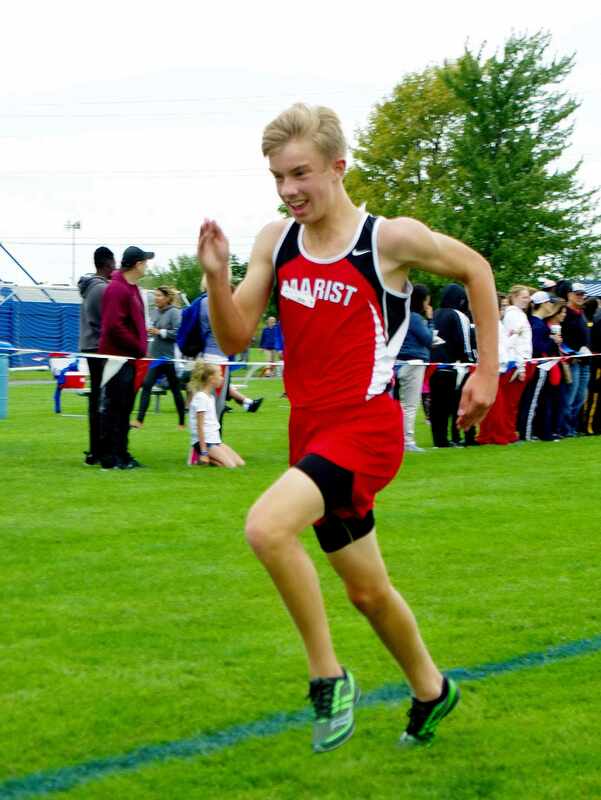 Marist Freshman Andrew Kerlin ran the first mile in 6:41, and then ran the second mile in 6:55, and then ran the final mile in a NEGATIVE split of 6:46 for an outstanding time of 20:22.00. Andrew Kerlin was awarded a RIBBON for finishing in 42nd place overall. 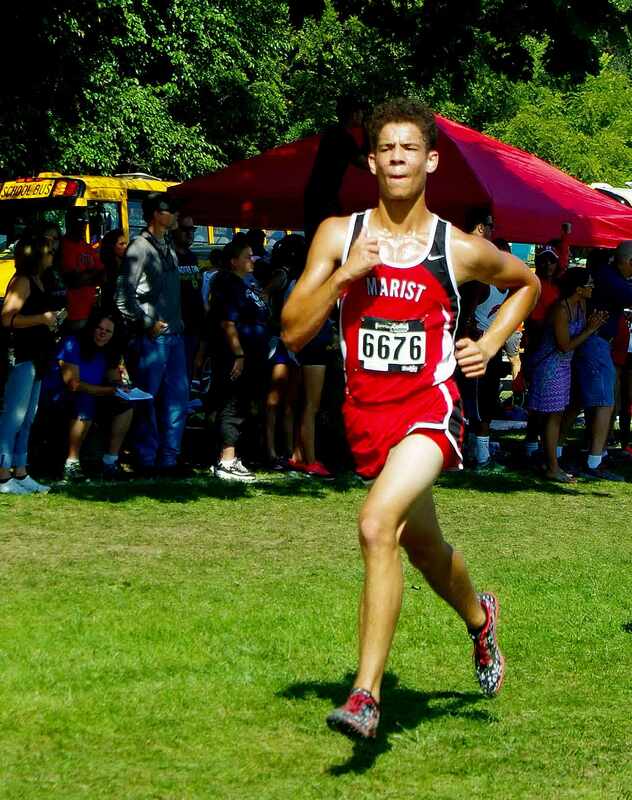 Marist Freshman Michael Golden drops 42 seconds and finishes sixth for the RedHawks at the Reavis Rams Invitational! Michael Golden finished sixth for the RedHawks and in 70th place overall with a personal best time of 22:21.80. Michael Golden dropped 42 seconds (23:03.00) off his career best time! 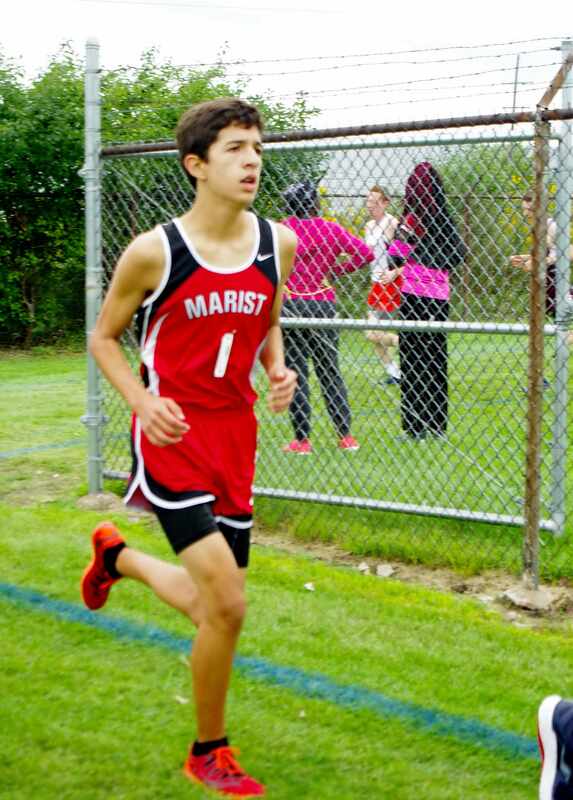 Marist Freshman Michael Golden ran the first mile in 7:23, and then ran the second mile in 7:49, and then ran the third mile in a NEGATIVE split of 7:09.80 for a personal best time of 22:21.80. 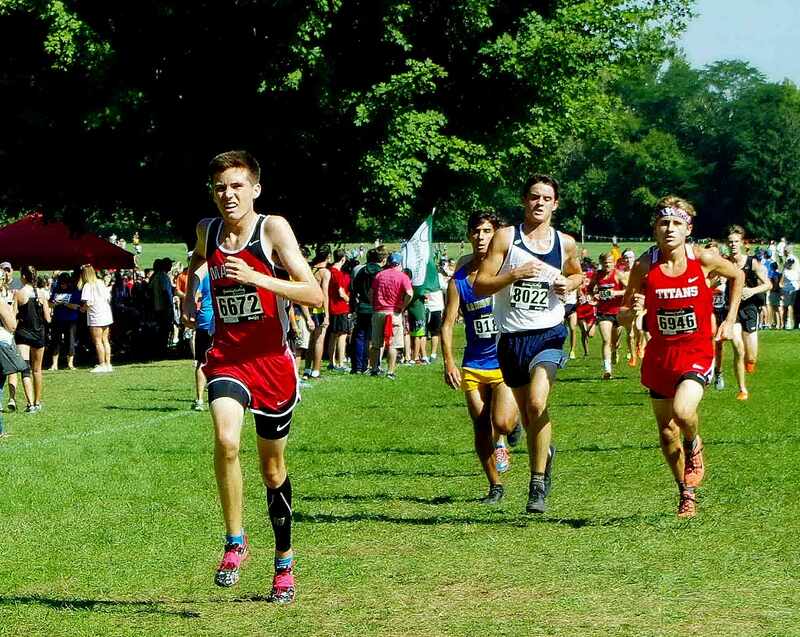 Marist Freshman Danny Enright finishes seventh for the RedHawks and drops ONE minute and 24 seconds off his best time at the Reavis Rams Invitational! Danny Enright finished seventh for the RedHawks in the Sophomore boys race and in 72nd place overall with a personal best time of 22:32.70. Danny Enright dropped one minute and twenty-four seconds (23:56.70) off his career best time! Danny Enright out kicks Stagg's Curtis Roberts to the finish line at the Reavis Rams Invitational! 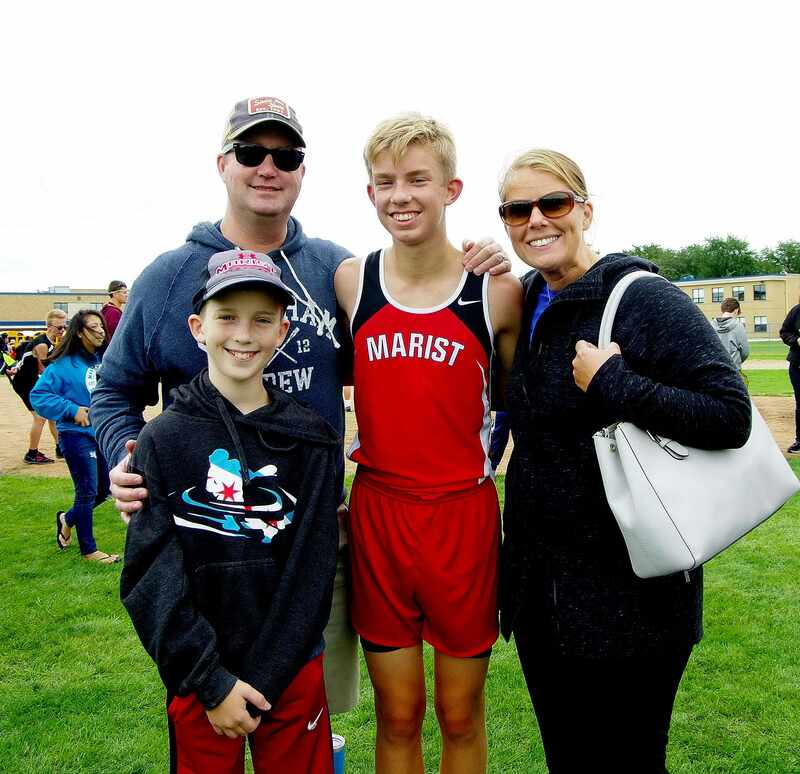 Marist Freshman Danny Enright ran the first mile in 7:23, and then ran the second mile in 7:58, and then ran the final mile in a NEGATIVE split of 7:11.70 for an outstanding time of 22:32.70. Marist Varsity Men post 24 victories at the Peoria Notre Dame Richard Spring Invitational! 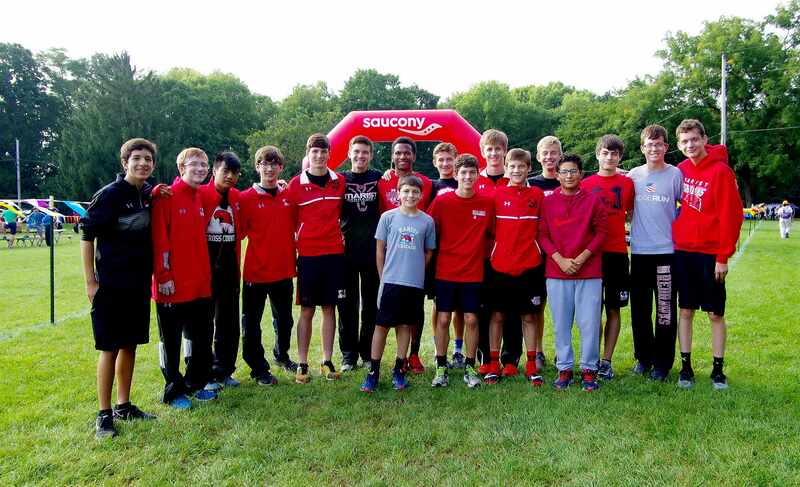 On Saturday, September 15, 2018, the Chicago Marist Varsity Men, Sophomore Boys, and Junior Varsity Boys Teams traveled to Detweiller Park in Peoria, Illinois for the Peoria Notre Dame Richard Spring Invitational. 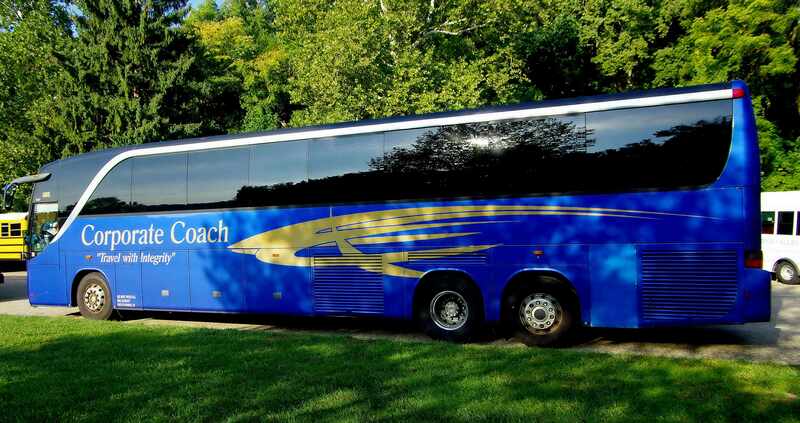 A Special thanks to the Marist Athletic Department for providing the TEAM with a coach bus for the trip. The IHSA State Championship takes place at Detweiller Park in Peoria, Illinois on November 3, 2018. This trip helped Marist athletes learn the IHSA State Championship course in September, and run fast times against great competition. The field for the Peoria Notre Dame Richard Spring Invitational featured a record 63 Teams. In 1996, Ben Zobrist finished in 111th place for Eureka High School at the IHSA State Cross Country Championships in Peoria, Illinois at Detweiller Park with an official time of 17:07. On November 2, 2016, Ben Zobrist was named World Series MVP for the Chicago Cubs. 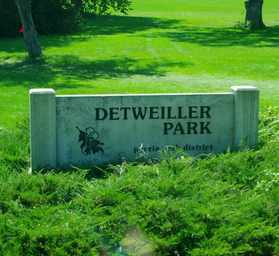 Mike Potter, of New York, recently said, "Who wouldn't want to come to Detweiller? 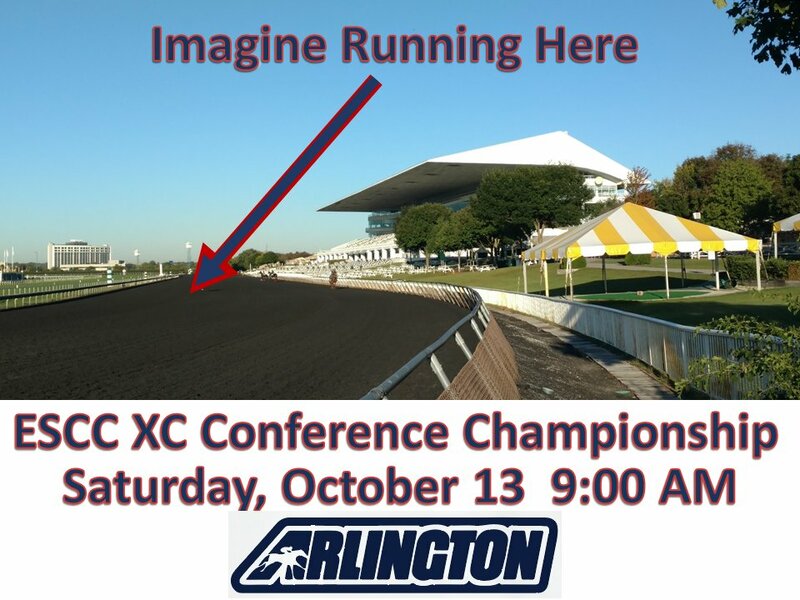 A famous course, with the nation's finest state of distance runners!" Spectators and athletes traveled from around the country for the Peoria Notre Dame Invitational. 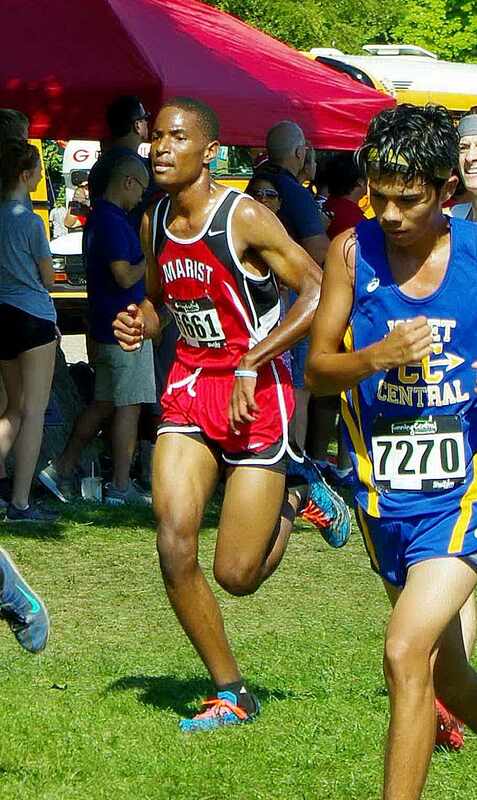 Marist had a BIG day in Peoria at the Richard Spring Invitational. The Marist Varsity Men improved by nine places from 2017 to 2018, and posted 24 victories! Four of the Marist Varsity Top seven athletes ran career best times! Six of the Marist Sophomore Top seven athletes also ran career best times! Five members of the Marist Junior Varsity Team also ran career best times! A special THANKS to the Leonard Family for providing 37 athletes and 3 coaches with lunch at Subway after the meet. Captain Thomas Leonard leads RedHawks with a personal best time of 15 minutes and 23 seconds at Peoria! 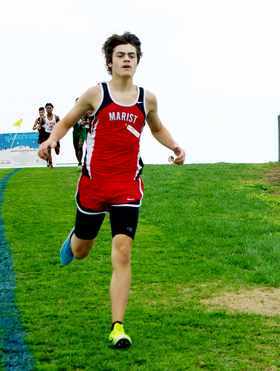 Marist Junior Thomas Leonard led the RedHawks with a personal best time of 15:23.40. 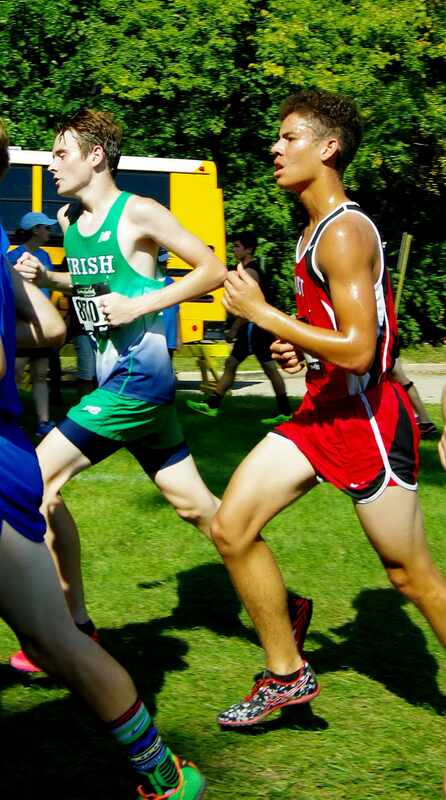 Thomas Leonard dropped 30 seconds (15:53.00) from the 2017 Peoria Notre Dame Invitational on the SAME course at Detweiller Park in 2018 with an official time of 15:23.40. 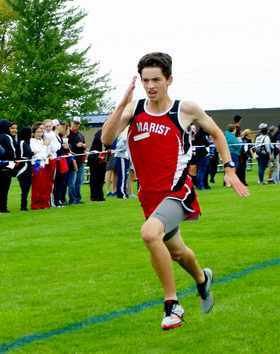 Marist Captain Thomas Leonard ran the first mile in 4:50, and then ran the second mile in 5:19 (10:09), and then ran the final mile in a NEGATIVE split of 5:14.40 for an outstanding time of 15:23.40. Thomas Leonard was also awarded a MEDAL for finishing in the Top 30 at the Peoria Notre Dame Invitational. Junior Caleb Davis finishes second for the RedHawks with a personal best time of 17 minutes and 17 seconds at Peoria! 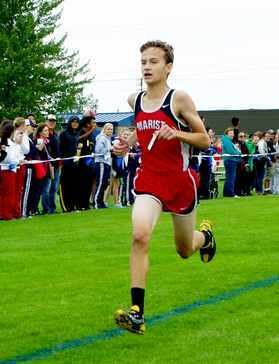 Marist Junior Caleb Davis finished second for the RedHawks with a personal best time of 17:17.80. Caleb Davis dropped one minute and four seconds (18:21.00) from the Reavis Rams Invitational with an official time of 17:17.80. Caleb Davis ran the first mile in 5:10, and then ran the second mile in 5:55 (11:05), and then ran the final mile in a NEGATIVE split of 6:12.80 for an outstanding time of 17:17.80. 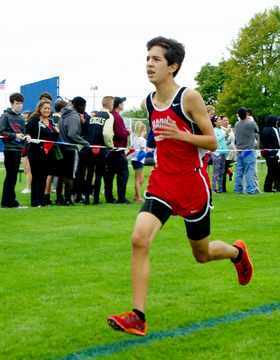 Senior Lucas Pennix finishes third for the RedHawks with an outstanding time of 17 minutes and 27 seconds at Peoria! 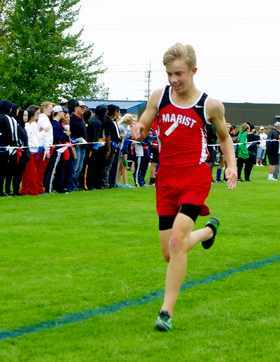 Marist Senior Lucas Pennix finished third for the RedHawks at the Peoria Notre Dame Richard Spring Invitational with a season best time of 17:27.00. Lucas Pennix ran the first mile in 5:23, and then ran the second mile in 6:09 (11:32), and then ran the final mile in a NEGATIVE split of 5:55 for an outstanding time of 17:27.00. 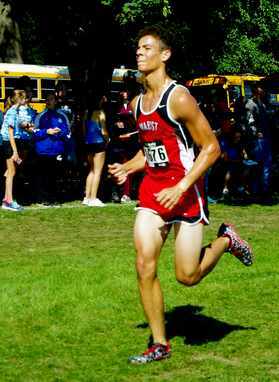 Captain Colin Tracy finishes fourth for the RedHawks with a season best time of 17 minutes and 32 seconds at Peoria! 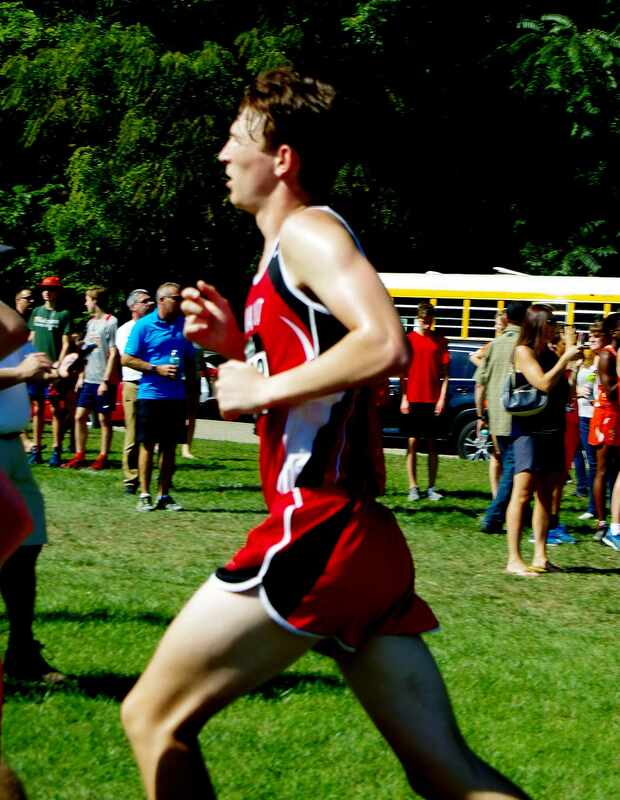 Marist Senior Colin Tracy finished fourth the RedHawks at the Peoria Notre Dame Richard Spring Invitational with a season best time of 17:32.20. Colin Tracy dropped 11 seconds (17:43.00) from the 2017 Peoria Notre Dame Invitational on the SAME course at Detweiller Park in 2018 with an official time of 17:32.20. 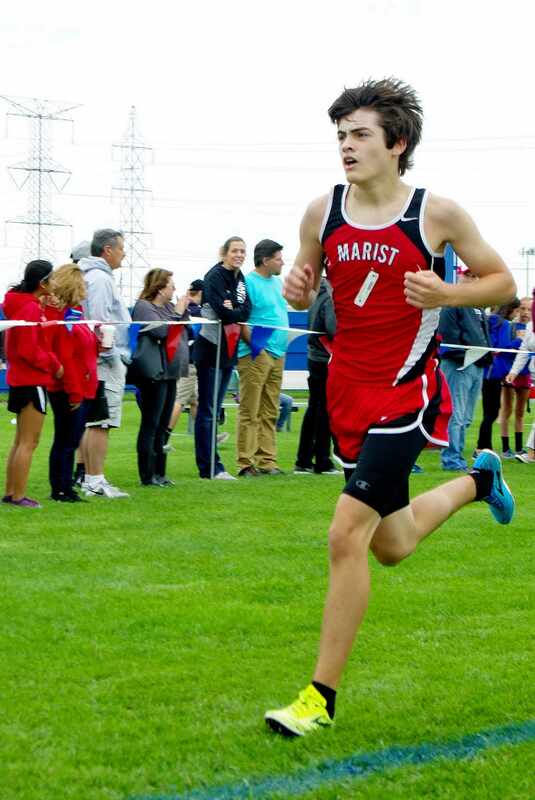 Marist Captain Colin Tracy ran the first mile in 5:34, and then ran the second mile in 5:59 (11:33), and then ran the final mile in an EVEN split of 5:59.20 for an outstanding time of 17:32.20. 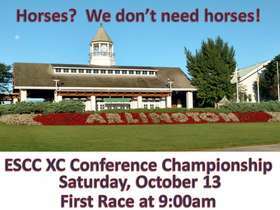 The East Suburban Catholic Conference Cross Country Championships takes place at historic Arlington Park. Arlington Park is located at 2200 Euclid Ave, Arlington Heights, Illinois. The East Suburban Catholic Conference Cross Country Championships features: Benet, Carmel, Joliet Catholic, Marian Catholic, Marian Central Catholic, Marist, Nazareth Academy, Notre Dame, St. Patrick, and Saint Viator. The Varsity Mens race commences at 10:30 am, and Chicago Marist is represented by Thomas Leonard (11th), Lucas Pennix (12th), Caleb Davis (11th), Colin Tracy (12th), Andres Castillo (12th), Brendan Geary (9th), and Tommy Kavanaugh (10th). MEDALS will be awarded to the Top 23 Athletes in the Varsity Mens race. The Sophomore Boys race commences at 9:30 am, and Chicago Marist is represented by Tommy Wagner (10th), Andrew Kerlin (9th), Luke Malzone (9th), Jonathan Rivera (10th), Nick Vallie (10th), Michael Golden (9th), and Danny Enright (9th). MEDALS will be awarded to the Top 23 Athletes in the Sophomore Boys Race. The Junior Varsity Boys race commences at 11:30 am, and Chicago Marist is represented by Luke Hortsman (11th), Aidan Dillon (12th), Josh Burns (11th), Joe Donnelly (12th), Brian Breslin (12th), Tyler Thomas (11th), Marty Thorne (9th), Gavin Carey (9th), Lester Scott (9th), Matt Walsh (9th), Andrew Cortesi (9th), Luis Esparza (9th), Mark Viz (9th), Terrence Cox (9th), Kaleed Chandler (11th), Antione Davis (11th), Nolan Light (10th), Angel Ortiz (10th), John Paul Koss (10th), and Eric Teverbaugh (12th). RIBBONS will be awarded to the Top 23 Athletes in the Junior Varsity Boys Race. Long-sleeve dry-fit style ESCC Conference t-shirts will be available for $20.00. The race course is located at Arlington Park (2200 West Euclid avenue, Arlington Heights), and there are several adjacent areas to the course ideal for Tailgating. 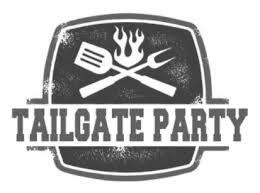 The Marist Coaching Staff and Parents will be hosting a Tailgate party after the meet. It will be a special experience for all of the athletes, parents, coaching staff, and guests. We need your help to make this event a success in 2018. If you could bring any kind of finger food, drinks, paper ware, plastic ware, card tables, let Coach Gordon know via email at Gordon.Jon@marist.net and he will post a list of items being brought to the Tailgate Party on our Team website. Olympic Gold Medal Winner Billy Mills will be addressing the Marist Cross Country Coaching Staff, after practice, on Tuesday, August 28, 2018. A special thanks to "Running for Kicks" for sponsoring the event. At the 1964 Olympics, Billy Mills shocked the world when he came from behind to win the Gold Medal. It was the greatest upset in Olympic history. Billy Mills is still the only American to ever win the Gold Medal in the 10,000 Meter run. Billy Mills was the inspiration for the movie "Running Brave". The movie stars Robbie Benson and chronicles the story of Billy’s life and the many obstacles he overcame to become an Olympic Champion. Billy grew up in poverty and was orphaned at the age of 12. 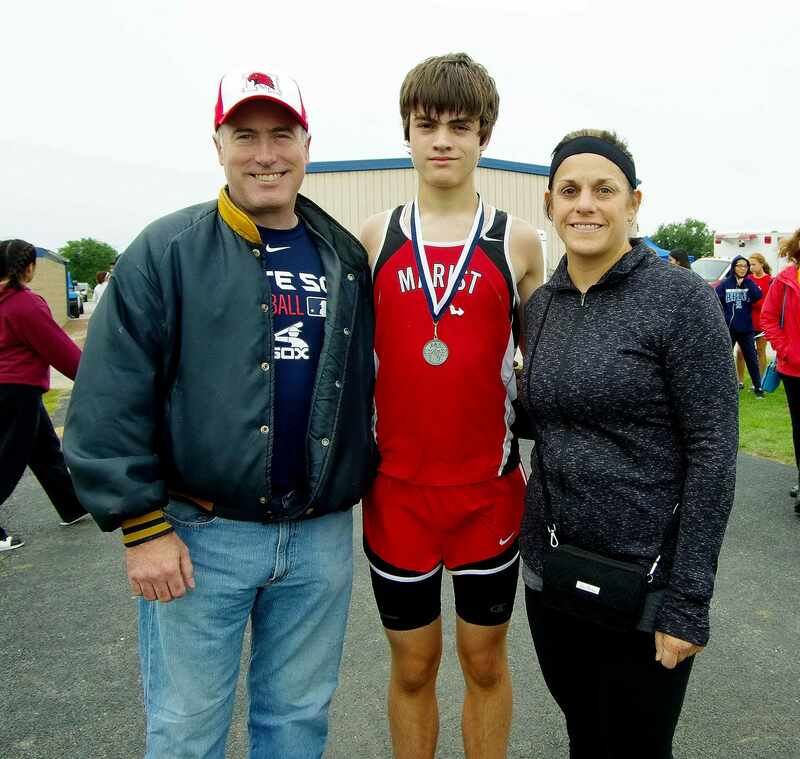 He turned to sports as a positive focus in his life and took up running while attending the Haskell Institute, an Indian boarding school in Lawrence, Kansas, and earned a Cross Country scholarship to the University of Kansas. At the University of Kansas Billy continued to improve as a distance runner. He was named a NCAA All-American cross country runner three times and in 1960 he won the individual title in the Big Eight cross country championships. In 1960, he did not make the U.S. Olympic Team, but did not give up on his Dream. 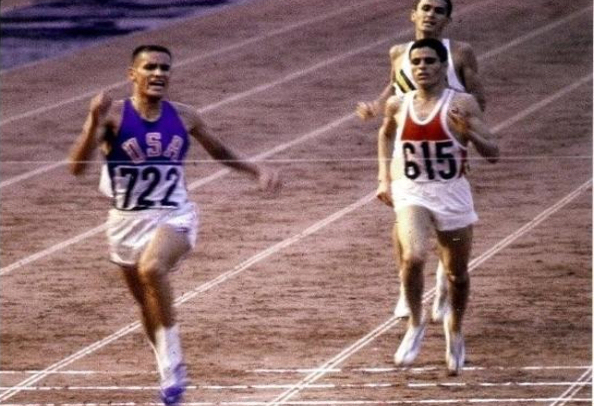 He trained four more years, and in 1964, Billy Mills made the U.S. Olympic Team. However, his qualifying time for the Olympics was almost a full minute slower than the favorite, Ron Clarke of Australia, and Mills was not even ranked as the top american. The pre-race media coverage focused on Clarke and his expected duel with Mohammad Gammoudi of Tunisia. Billy went largely un-noticed. The field for 10,000 meter final included many Olympic medalists and world record holders. Billy Mills followed his dream, regardless of the odds, and came from behind to win the Gold Medal, and break the Olympic Record, in the most dramatic race and dramatic final lap in Olympic history. Billy Mills was featured as Sports Illustrated's Athlete of the Century from South Dakota, and was recently interviewed by Tom Brokaw on NBC Nightly News, and by Byrant Gumbel on HBO Real Sports.Billy Mills was inducted into the United States Olympic Hall of Fame, and is a member of the United States Track and Field Hall of Fame, the National Distance Running Hall of Fame, the Kansas Hall of Fame, the San Diego Hall of Fame, and the National High School Hall of Fame. On Wednesday, August 8, 2018, the first Cross Country practice of the 2018 season took place at Chicago Marist. During the TEAM warm-up, Marist Head Coach Jon Gordon asked each runner to go out and bring back one stick to place in a pile. He then took all of the sticks, bound them togehter, and asked a Freshman athlete to try and break the bundle. The athlete failed. No one could accomplish the feat. Coach Gordon then took one stick from the bunlde, and easily broke the single stick across his knee and tossed the parts aside.